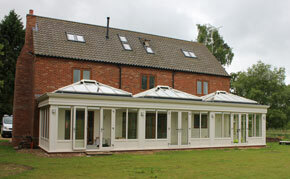 Orangery suppliers & manufactures, supplying orangery roofs with bespoke design. Orangery Solutions has developed a unique, patented system which offers unparalleled guaranteed structural integrity and results in beautifully finished orangery projects that complement any home. Working alongside builders and architects, these are tailored and manufactured to meet all technical specifications and come with professional structural calculations that conform to all building legislation requirements. Ultimately, many people choose a bespoke orangery from Orangery Solutions due to its rigid strength and the wide variety of finishing styles that are available which complement easily with all property types. Our more distinguished extensions come with solid warranties and can be used all year in a variety of ways, reflecting personal taste and lifestyles. 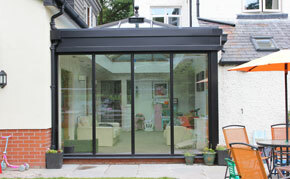 With an established 20 year reputation in the building industry, Orangery Solutions was established and subsequently developed a novel concept, providing installers and investors with a premium orangery product that offers unmatched structural integrity. Consisting of a unique, patented internal structural core all complemented by a suite of harmonized concepts, the Orangery Solutions system can be tailored to individual requirements, will provide unrivaled structural guarantees and gives the orangery or sun-room a striking finished appearance that adds true beauty, style and character to any home. With a broad range of harmonized orangery concepts, designed to complement modern or traditional orangery and sunroom styles. Our wide variety of fascias, cornices and pilasters perfectly complete any project. Offering unmatched reliability and durability, our structural system is strong, proven and guaranteed. Providing professional services combined with industry recognised manufacturing methods, we offer guaranteed reassurance.